Farhad Baqi and Xiaolun Guo discuss the ESPers water project. 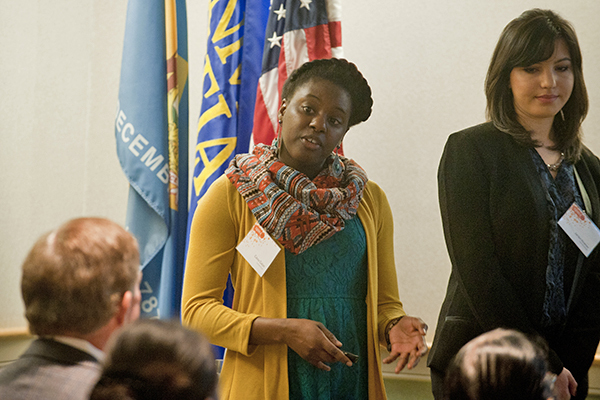 Cassy Galon and Jaclyn Kramer answer questions about the ConnectHub project. Jack Sherry, Amy Lalime and Gabriel Szczepanek discuss the mTrigger project. Akuma Ukpo discusses the PocketFarmer app. David Weir, director of the Office of Economic Innovation and Partnerships, introduces the ESPers team. 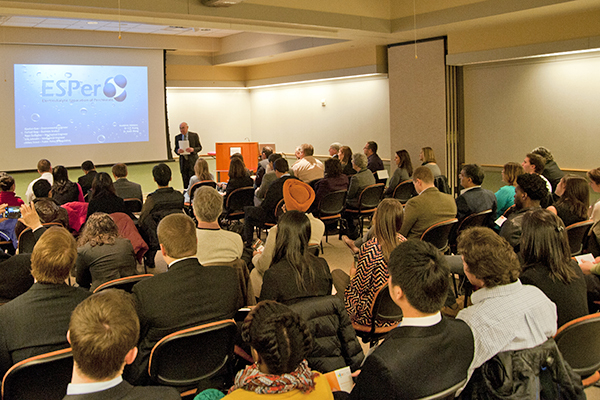 Work of young innovators was highlighted at the Spin In Showcase held at the Delaware Biotechnology Institute. 11:07 a.m., Feb. 16, 2015--They went back to the proverbial drawing board time after time, four teams of inventive University of Delaware students testing this equation, that logo and yet another configuration. 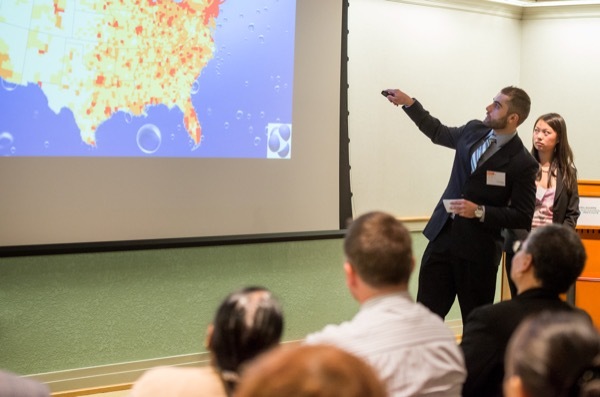 What they came up with -- these young engineers, scientists, marketers, artists, business analysts and public policy wonks -- were products that soon could deliver cleaner water for millions, better field training for pharmaceutical professionals, healthier Christmas trees and biofeedback to put the fun back into physical therapy. 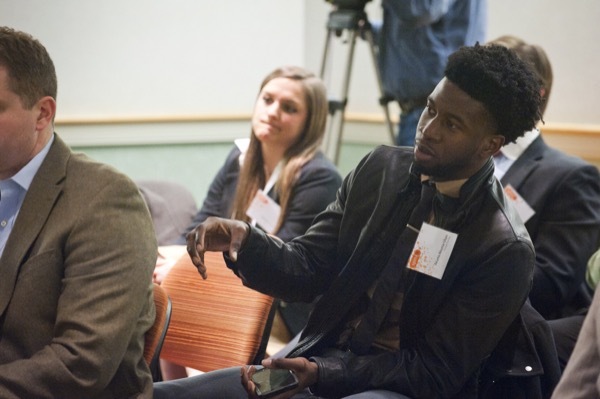 The projects all were part of the Spin In Student Showcase, sponsored by the Office of Economic Innovation and Partnerships earlier this month at the Delaware Biotechnology Institute. 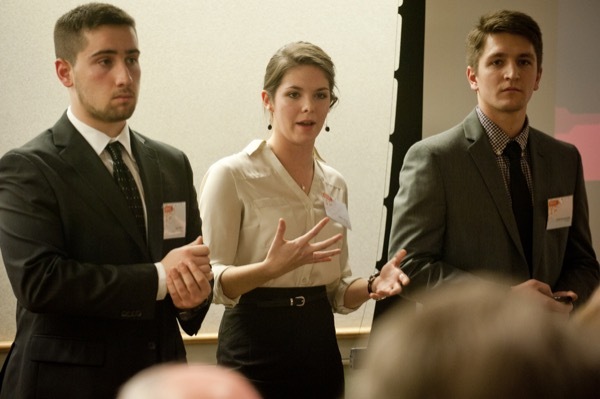 The UD program offers students practical business experience and gives entrepreneurs access to their expertise to solve a problem or refine a process. The challenge "spins in" to the students, who -- with the guidance of a skilled mentor -- attack it from many angles and spin out a recommendation or a prototype. At the same time, team members learn the realities of engineering, business or policy dynamics from their fellow students. "Ryan [Gallagher] and I have always dealt with other mechanical engineers," said Erik Johnson, a mechanical engineering student. "We never worried about regulators. You tell us to invent something or build something and we just go into the shop and come out and say, 'Look what we made!' We learned a lot from this." Andrew Seski said the same about his team, which was asked by the Cooperative Extension Service to develop a mobile app to help Delaware farmers. "Four weeks ago, five strangers met in a room with a simple request," he said. They emerged with PocketFarmer, now in beta testing, designed to help Christmas tree farmers identify problems and stop diseases that could damage their trees and their business. The first team called itself the ESPers -- not for their extrasensory perceptive prowess but for the device team members developed to allow electrodialytic separation of perchlorate from drinking water. The device uses electric current and a specially designed membrane to remove perchlorate toxins -- the kind found in explosives, fireworks and fertilizers -- from drinking water. More than 11 million people live in areas where perchlorate contamination has been identified in drinking water, according to Farhad Baqi, business analyst for the group. A prototype developed by UD doctoral student Kevin Wang was promising but needed work to allow a continuous flow of water and remove perchlorate without removing beneficial minerals. The ESPers came up with a design that was more efficient, requiring less heat and allowing continuous flow, more effective at removing perchlorate, and provided a specific remedy to a problem the U.S. Environmental Protection Agency may soon regulate. Entrepreneur John Royer got a boost from a team that developed a smartphone app -- ConnectHub -- that pharmaceutical sales reps can use when they are on the road. The application is designed to allow managers to coach their sales reps and evaluate performance along the way. The team's business analyst said quotas are exceeded by sales representatives who get three or more hours of coaching each month. Those who get less than two hours fail to meet their quotas, the team reported. That difference could mean millions to the firm's bottom line. The application developed by the team allows for face-to-face conversations, such as those done by Skype, but also allows pre-call planning templates, real-time document markup, quick records for performance evaluation, and group chats. The honeycomb-styled logo was splashed with orange, artist Cassy Galon said, because singer Frank Sinatra dubbed it "the happiest color." PocketFarmer is designed for Christmas tree growers now, but team members said it could have multiple applications in horticulture. It takes six to 10 years to grow a sellable tree, the team said, and insects and disease can devastate that work quickly. The app puts a powerful database into the farmer's pocket, with a question-based troubleshooter type prompt, photographs of limbs or trees that show the kind of damage a disease might cause, the ability to select for the time of year or the part of the plant affected, explanations of symptoms and various treatments, and the ability to use the phone's GPS and camera to identify and photograph the area of concern. Financial records and other notations could be added, too. The device would not replace the need for a diagnosis by a Cooperative Extension agent, students said, but would allow a farmer to see when such assistance might be necessary. A contact aid would be part of the application, they said. Limping patients or those with aching backs who decide they can't afford the time or money to go to sessions with physical therapists might see things differently after working with the mTrigger device developed by another Spin In team. The device plugs into the headphone port of an iPhone, then attaches to sensor pads on the patient’s skin. As the patient goes through various exercises, the app records the intensity, speed and range of muscle motion, tracking the patient's progress and also putting that data into a game environment that gives each patient a bit of competitive incentive to keep working at it. Patients could save money by using the device at home and reducing their need for physical therapy sessions, students said. Physical therapists might see that as competition, students agreed, but other business models could be explored -- perhaps allowing clinics to gain income as the devices are sold or perhaps exploring subscription models. The Spin In Showcase is supported by the National Science Foundation's Experimental Program to Stimulate Competitive Research (EPSCoR), which had a team on site to observe the presentations. The NSF representatives asked each team questions about their products and business plans, and they got detailed answers in most cases. "The enthusiasm and commitment to solving a real issue and the power of collaboration -- that was evident," said Denise Barnes, EPSCoR section head. "It was very professional, and the passion came through in the way they work in groups." Sean Kennan, who is a program director at EPSCoR, said the UD program might be the most well-developed the visiting team has seen. "I was impressed that all of these projects are viable," he said. EPSCoR's Uma Venkateswaran, also a program director, said it was helpful to see the work in person. She was impressed by the progress the teams made in such short periods. "The advanced level of the projects and the commercialization -- they are ready to launch," she said. The experience students gain in this kind of exercise will serve them well when they are looking for jobs, said executive Bryan Pryor, who worked with the mTrigger team. An engineer with a sense of market dynamics could easily work as a product manager, he said. "If they come into an interview and have this on their resume, they did this project -- if an engineer uses the word 'market' -- to play on the team well you have to have an understanding of what market is," he said. Pryor predicted mTrigger would go to market in a few months. 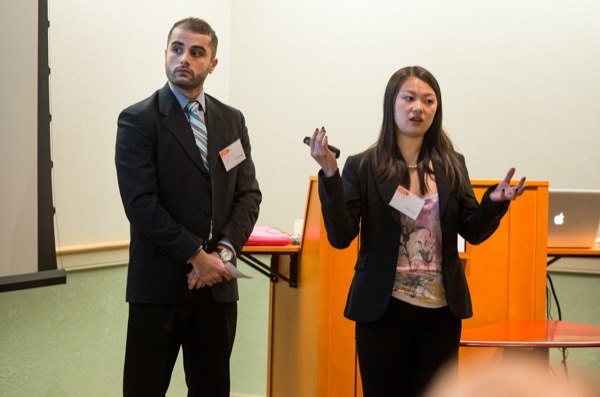 ESPers: Xiaolun Guo, environmental engineer; Farhad Baqi, business analyst; Ryan Gallagher, mechanical engineer; Erik Johnson, mechanical engineer. ConnectHub: Benjamin Bugher, Cassy Galon, Jaclyn Kramer, Rebecca LaPlaca, Linfeng Li, Michael McClosky, Jacob Nachman. PocketFarmer: Akuma Ukpo, computer engineering; Michelle Lifavi, communications; Nathan Smith, plant science; Andrew Seski, finance/business management; Jack Sherry, design/graphics. mTrigger: Adam Engelson, electrical engineering; Amy Lalime, business development; Abagail Scout, policy and regulation; Jack Sherry, graphic design; Matthew Spicer, iOS development; Gabriel Szczepanek, biomedical engineering. 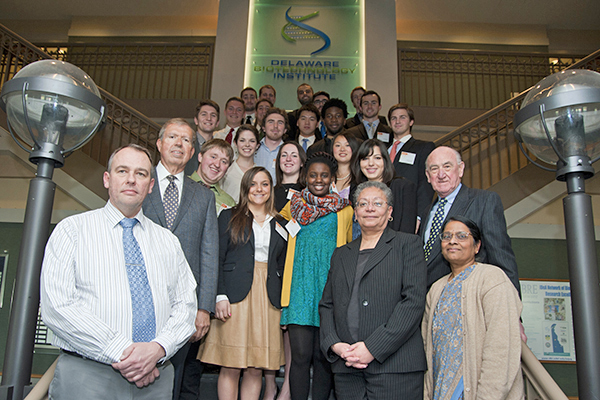 The mission of the Office of Economic Innovation and Partnerships (OEIP) is to develop social and economic value from UD’s knowledge-based assets by advancing the University's intellectual property, inventions and technologies from the laboratory to the marketplace through partnerships and collaborations; promoting innovation and entrepreneurship within and without the University community; and providing leadership in the creation and growth of small businesses in Delaware.